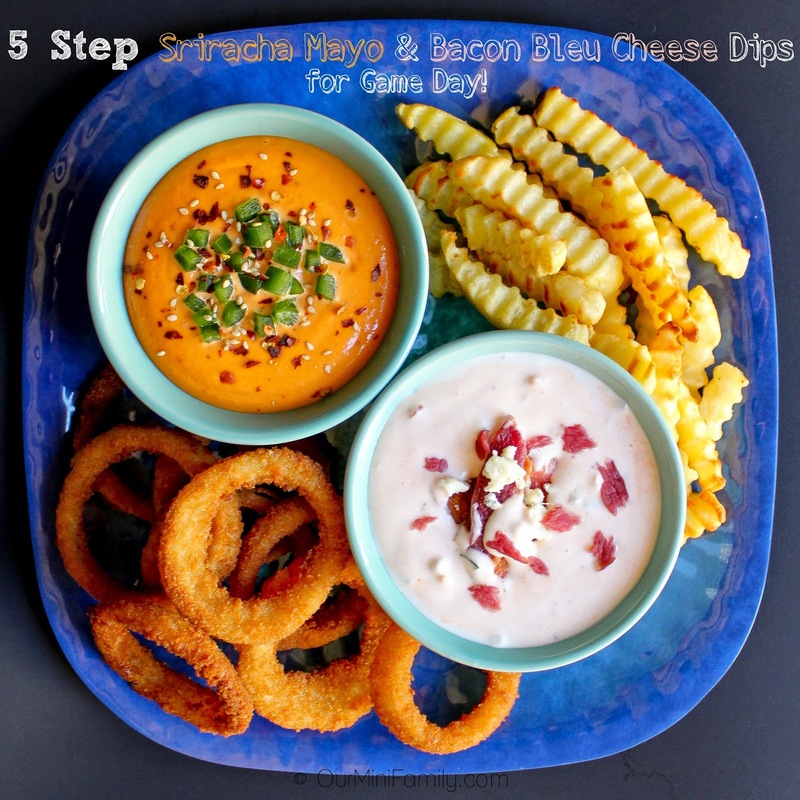 5 Step Sriracha Mayo and Bacon Bleu Cheese Dips for Game Day! Hi folks! Wow, loads of great games lately, right?! For us, that means lots of party planning and game day grub to enjoy around this time of year! We wanted to share two special dips recipes with you today--they are 5 step dips, so they are not time consuming or difficult to whip up at all. For Adam and I, we're all about the games but honestly let's be real here: food is what can really bring people together! Game day grub is my favorite because there is less of a focus on calorie counting, and it's all about enjoying yourself without having to take the time to pull together a rather intensive recipe--I am a fan of not having to spend my whole day in the kitchen leading up to game. That is why I love dips so much! So hearty and tasty--perfect to enjoy while we kick back in our living room and have our very own indoor tailgate party. Although this time of year in Arizona is perfect weather for tailgating since it's mid 70s during the day, it can get rather chilly at night so we love being able to have our game day grub inside instead! 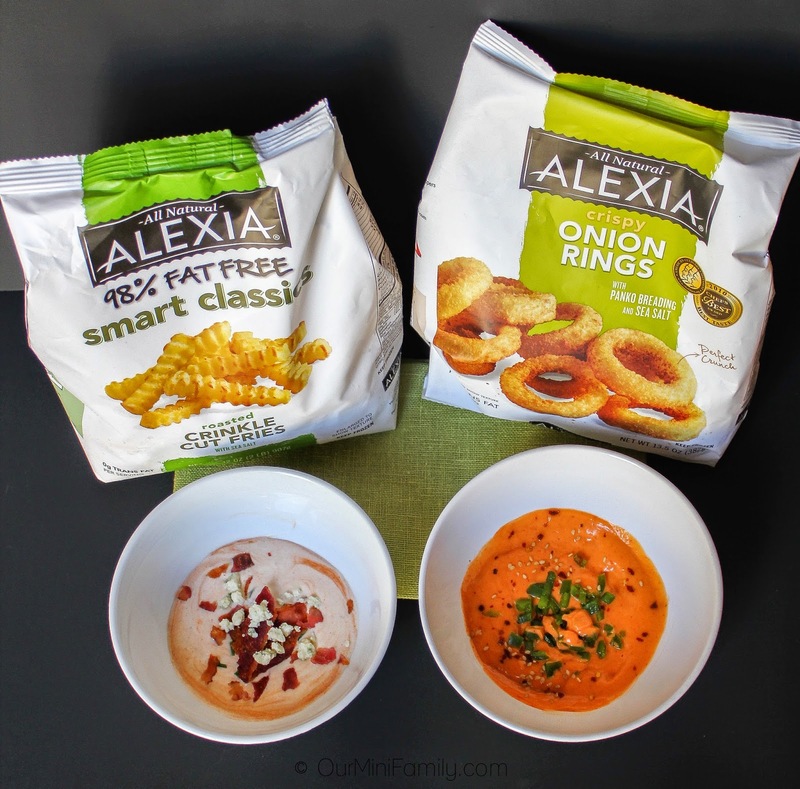 Although we tend to make a lot of different things to eat on game day, one of our go-to classics is Alexia Foods Smart Classics Crinkle Cut Fries and Alexia Foods Crispy Onion Rings. They taste amazing, are super easy to make, and pair perfectly with so many different styles of dips. 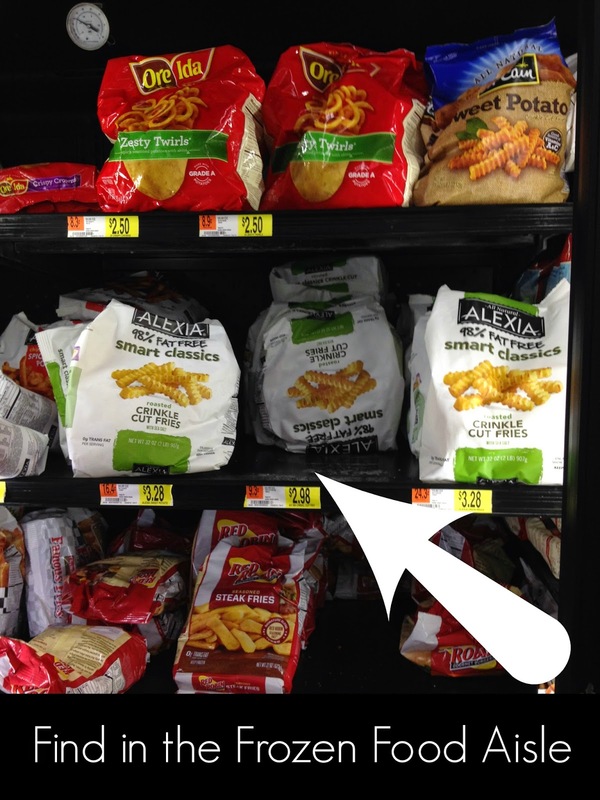 Another thing I keep in mind too when I am putting together a list of foods for the day of the big game is its convenience factor; it's always convenient for me to buy Alexia Foods products right at Walmart in the frozen food aisle. It is super easy for me to get into the store, head right to the back where the freezers are, and grab what I need and go! Both of these dips are huge hits for everyone who has tried them! 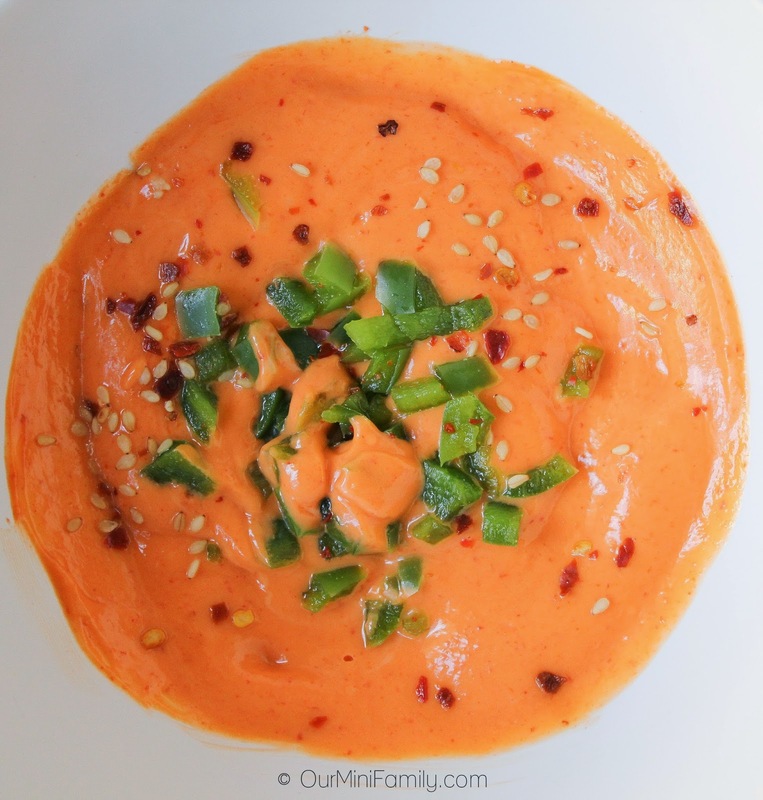 Our Sriracha Mayo dip is definitely intended for those who enjoy spicier dips, so you may just want to keep that in mind if you want to prepare it. 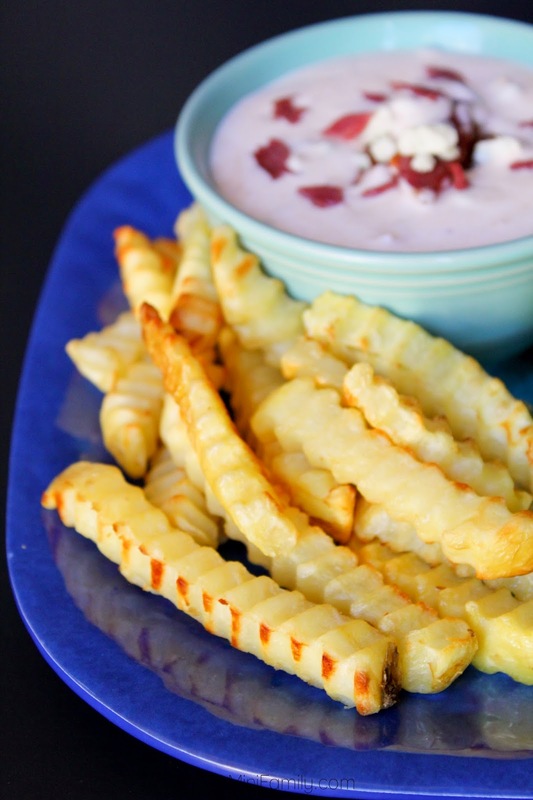 These are seriously awesome dip recipes, and I am so stoked to share them with all of you now! Spoon your mayo into a small mixing bowl. Pour in your Sriracha and mix well. It should give it an even an orange color when you are done mixing. Add in your chopped green peppers and mix. Now, mix in your crushed red pepper and sesame seeds. 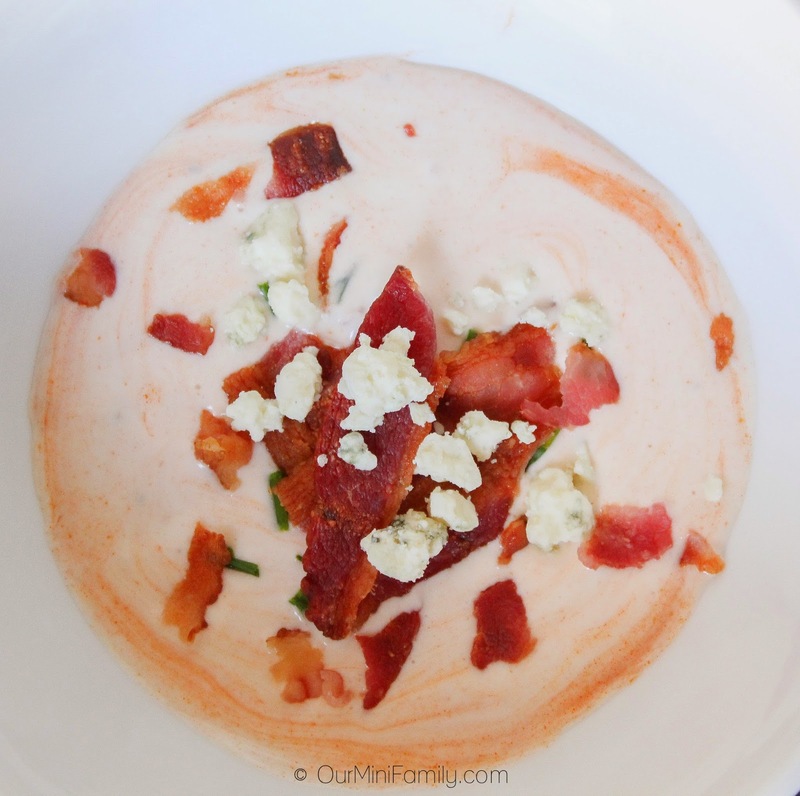 Spoon your bleu cheese dressing into a small mixing bowl. Pour in your buffalo sauce and mix well. Add in and mix your chopped chives. Prepare and crumble bacon into the bowl and mix. Top with bleu cheese. And here is a graphic I put together to demonstrate the 5 steps to make these fantastic dips that go so well with the Alexia Foods game day grub we love and enjoy! Feel free to pin it and keep it for later too if you are not needing a dip recipe right now--oh, and speaking of Pinterest, have you seen the Alexia Foods on Pinterest page? It has a lot of awesome recipes linked up from other bloggers that are all great, too! No matter what your go-to game day grub is, I hope you all have something tasty to enjoy while you are gearing up and tailgating with your friends and family! What do you make for your Game Day Grub? Oh yum...I'm always wondering what to do w/ Sriracha. BTW- love the graphic. Thanks so much! OH and if you like burgers, you should try to add a little Sriracha to it, too! Ok, I totally have to pick up those onion rings! Those dips looks amazing! My husband would love the bacon one. Yeah!! They are so yummy, and I am glad you like it! 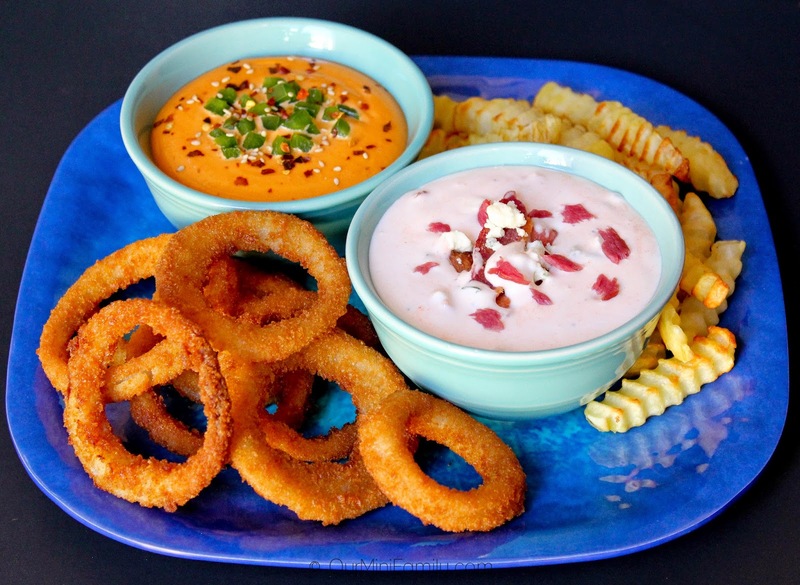 I would dig the onion ring and chips too.. lovely dips you made to go along with the snacks. We love Alexia here. Those dips look amazing! Yes Alexia is one of our favorite appetizer choices! And thanks! I love Alexia sweet potato fries. I haven't tried their onion rings yet. The sauces look delicious too. My favorite game day grub is pizza or wings. Yes! You cannot go wrong with either of those, and sweet potato fries are good too! Thank you! Haha too funny! 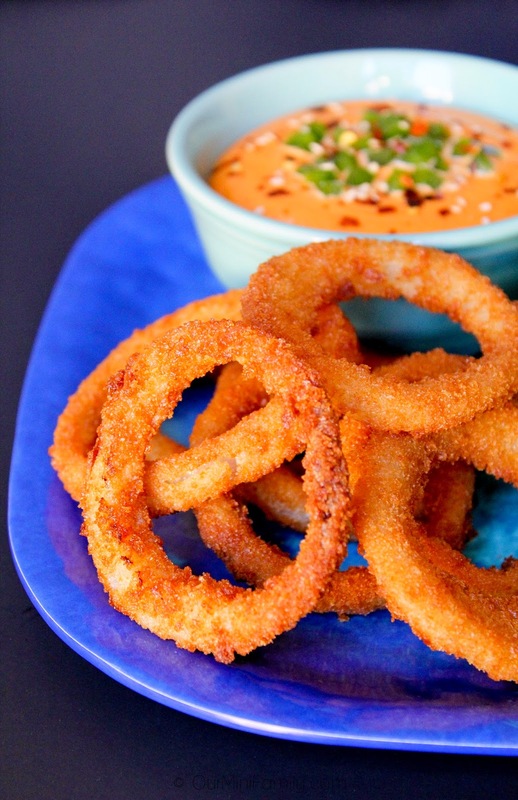 Yes fries/rings and dips are fabulous! 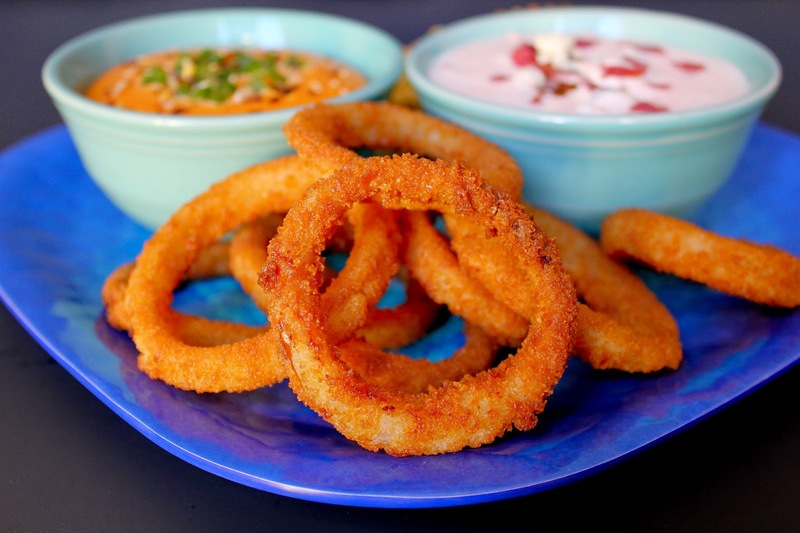 Looking at the photos made me crave for fries and onion rings! They look super yummy! All of those dips look delicious. I love the step by step photos. We just bought some Alexia fries last week and I loved them. I will be buying them again. I am so glad you liked them--we did, too! And thank you so much! Yes ma'am! I'm in. For both! I love dip and I love all the flavors in these! I love that you added a homemade sauce to these store-bough apps! I love sriracha too BTW!! These look so good. My husband is big on dips! Agreed that I would have never know what to do with sriracha and I love your recipe. Great photographs, too! This looks perfect for watching sports. I love the dips. It's such a great game day appetizer!